Lunar meteorite ages present new, strong evidence for the "lunar cataclysm," a 20-to-200 million-year episode of intense bombardment of the moon and the Earth at 3.9 billion years ago when the first evidence of life appeared on Earth, planetary scientists report in the Dec. 1 issue of Science. Whether or not there was life on Earth at the beginning of the bombardment, such cataclysmic pounding would have enormous consequences for life on this planet, whether by destroying existing life or organic fragments or by delivering molecules and creating conditions suitable for life, the researchers add. Barbara Cohen of the University of Tennessee - Knoxville analyzed the lunar meteorite ages for her dissertation research at the University of Arizona in Tucson. Timothy D. Swindle and David A. Kring of the UA collaborated on the study and are co-authors on the Science article. Swindle supervised Cohen's research. Kring is an expert in impact cratering and one of the discoverers of the K/T boundary Chicxulub impact site. Moon rocks returned by the Apollo and Luna missions in the 1970s suggested that Earth's moon was blasted in a maelstrom of solar system debris at 3.9 billion years ago. A great swarm of asteroids or comets pounded the lunar surface during a brief pulse in geologic time, melting rocks, excavating vast craters and resurfacing Earth's natural satellite. But for safety and communications reasons, both manned and robotic spacecraft were landed near the moon's equator, on the side facing Earth. 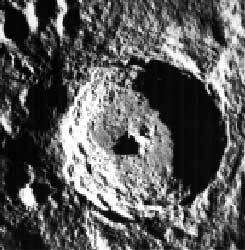 No one could say if just this part of the moon or the entire moon had been hammered. Cohen, Swindle and Kring bring the most significant data in nearly 30 years to bear on this question. They used an argon-argon dating technique in analyzing impact melt ages of four lunar meteorites -- rocks ejected at random from the moon's surface and that landed on Earth after a million or so years in space. They find from the ages of the "clasts," or melted rock fragments, in the breccia meteorites that all of the moon was bombarded 3.9 billion years ago, a true global lunar cataclysm. Barbara Cohen holds chips of meteorites DaG262 and DaG400 used in the analysis. Further, although the moon may have been bombarded before 3.9 billion years ago, the scientists find no evidence for it. If there were no earlier bombardment, scientists must jettison theoretical models that assume a steady falloff in the lunar and inner solar system cratering rate through time. "Given the model of what was going on in the solar system, there is no obvious reason why you should suddenly have a bunch of things banging on the moon 4 billion years ago and not 4.2 billion years ago," Swindle said. But the most dramatic implication is what happened during this event on Earth. "The Earth is a much bigger target than the moon, " said Kring, associate professor at the UA Lunar and Planetary Lab. "Earth would have been bombarded by at least 10 times as many impact events as the moon, and these impact cratering processes are immense. The Chixculub crater that we identified, which is related to the mass extinction of dinosaurs and other life 65 million years ago, is puny by comparison to the scheme we are talking about. Here we are talking about impacts that are 10 times larger, impacts that blasted craters rim-to-rim the size of continents on Earth today." "The bombardment would have charged the atmosphere with silicate vapor and vaporized the oceans, so if there was life on Earth before the bombardment, the question is what, if anything, survived," Swindle said. Perhaps some genetically primitive "extremeophiles" survived, he added. This kind of life is found on Earth today deep in rocks or living at the ocean vents. What did the bombarding? More likely asteroids than comets, based on some evidence from meteoritic trace constituents involved in the impacts and on other studies on what was happening at the time in the asteroid belt, Kring suggests. "When we first started this research, the goal was to find something older than 3.9 billion years," Cohen said. "We were very surprised at the evidence presented by seven different impacts, which pointed to 3.9 billion years." Swindle said, "Going into this study, I would have bet that we wouldn't have found these results. I would have bet that we would have seen impacts earlier than 3.9 billion years ago." Kring said, "I've quit being surprised at what impact cratering processes can do."